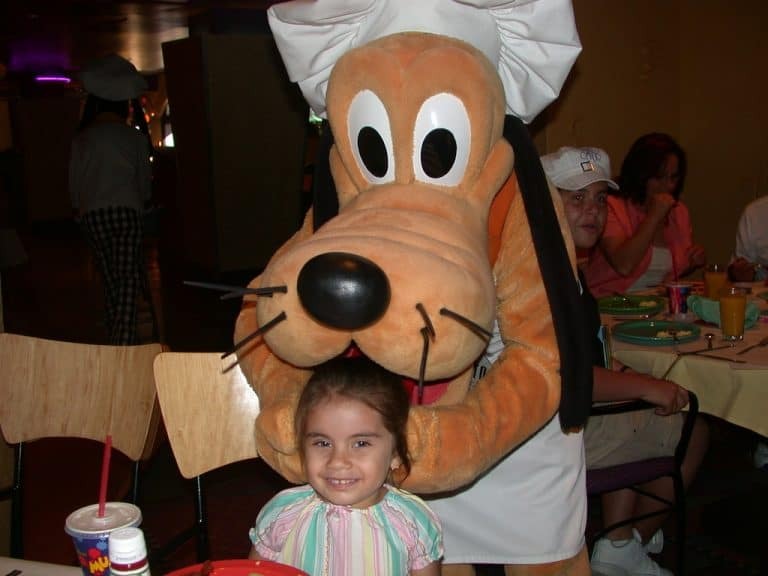 Kids adore Disney characters, and we all love good food. Merge the two together and you end up with one unforgettable meal. Navigating the world of character dinners at Disney World seem a bit overwhelming but don’t worry, we’ve got you covered. Here is everything you need to know about every Disney World Character dining experience offered. We hope this guide will help you choose the right experience for your family, from character breakfasts to special table service dinners. Don’t miss our 15 Know-Before-You-Go tips for your Disney Vacation! 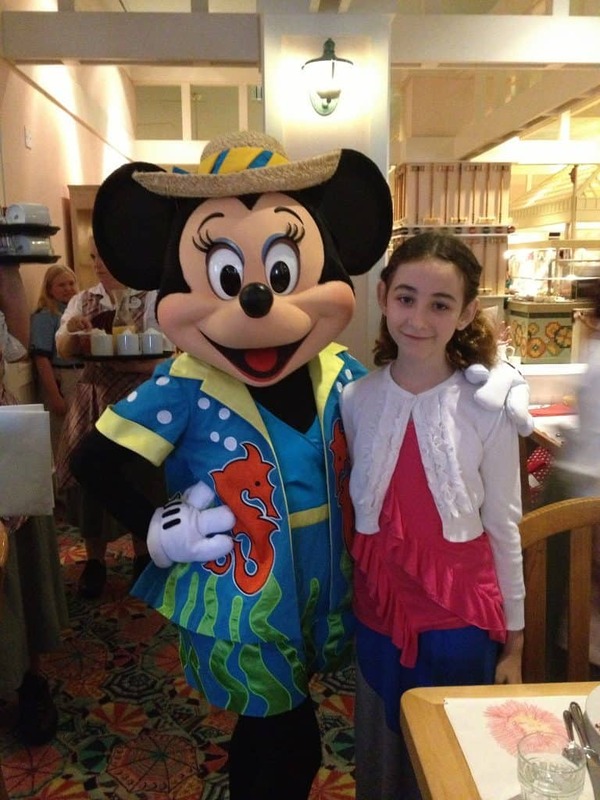 Disney World character dining experiences are extremely popular. Many fill up soon after reservations open. Reservations can be made up to 180 days in advance via the Disney World website. Be willing to be flexible about what time and day you dine in order to have the best chance of securing the character dinners at Disney World you are hoping to experience. Cancellations do occur, so check back often to see if anything opens up. You may get lucky! Character dining is not cheap. You are paying for more than a meal, you are paying for an experience. That being said, we all have budgets. Some dining experiences are less expensive than others and breakfast is always less expensive than lunch or dinner. Remember that Disney defines children as 3-9 year olds for pricing purposes. If you have a child that is 10 or older, expect to pay adult prices. One important thing to keep in mind when booking your Disney World character dining experiences- theme park tickets are required for any character dining within the 4 Disney World theme parks. They are not required for character dining at Disney hotels. Looking for more great Disney World dining recommendations? Check out Beyond Character Dining: 5 of the Best Disney World Restaurants for Families. Meals Served and Approximate Cost: Breakfast is about $73 per adult and $43 per child. Lunch and dinner are about $90 per adult and $53 per child. This meal requires two credits on the Disney Dining Plan. Who doesn’t want to eat in Cinderella’s castle? Enchanting and elegant, this dining experience is what your little princess has been dreaming about. After entering on the first floor and taking a picture with Cinderella herself, guests ascend the grand staircase to reach the upstairs dining room. Young diners are given a wand or sword and a wishing star as souvenirs. 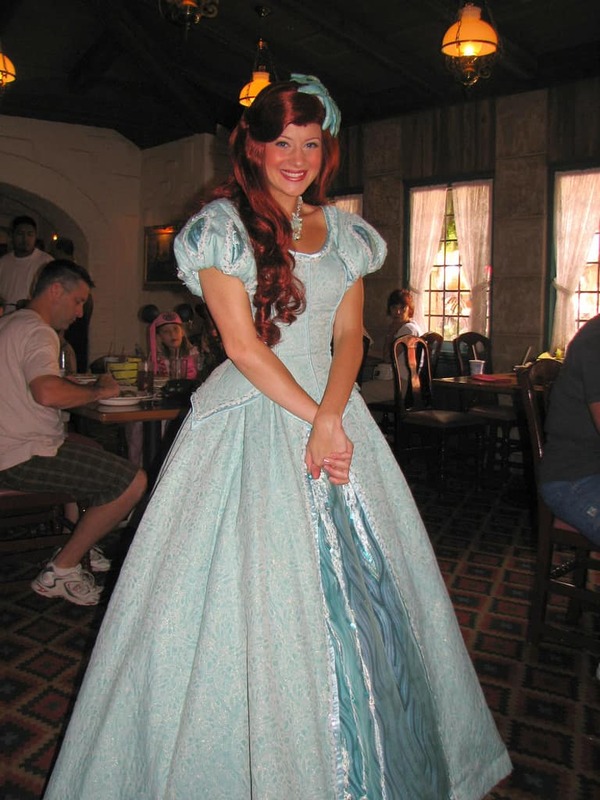 During the meal, enjoy visits by princesses such as Belle, Ariel, Snow White, Jasmine, and Aurora. There’s even a chance to join a parade around the restaurant. This is not a buffet. Guests select options from a pre-fixe menu. Breakfast options include caramel apple french toast, shrimp and grits, and beef tenderloin and eggs for adults. Kids are served items such as bacon eggs, Micky waffles, and cereal. An assorted pastry platter is shared by the table. Juice, coffee, and other non-alcoholic beverages are included. Lunch and dinner are three courses. Adult appetizers are soup, salad, or charcuterie. Braised pork shank, beef and shrimp, veggie couscous, and fish of the day are some of the entree options. Chocolate mousse and cheesecake are a couple of the dessert options. Salad or cheese and grapes are the kids’ appetizer options. Entrees include turkey pot pie, roasted chicken leg, mac and cheese, chicken nuggets, beef tenderloin, and fish of the day. The most popular kids’ dessert is the “build your own” cupcake. Be sure to look for Cinderella’s mice friends hiding in the rafters while waiting to meet with Cinderella and before ascending the stairs to the restaurant. The best seating of the day is the first seating because you can enter the Magic Kingdom before everyone else and get some incredible pictures on Main Street. Children are highly encouraged to dress up in their favorite royal gowns. When to Book: This is an extremely popular experience. Definitely try to book 180 days out and keep checking for cancellations if you don’t get in. Read more about dining at Cinderella’s Royal Table. Meals Served and Approximate Cost: Breakfast is about $38 per adult and $23 per child. Lunch and dinner are about $50 per adult and $30 per child. This meal requires 1 credit on the Disney Dining Plan. Dine on Main Street with friends from the 100 Acre Woods. Have the autograph books out and ready for Pooh, Tigger, Eeyore, and Piglet. This a buffet-style meal and serving American food. Breakfast includes the usual suspects: eggs, potatoes, pancakes, bacon, cereal, etc. Lunch and dinner highlights include soups, salads, pastas, carved meats, fish, and veggies. Of course, leave room for dessert. Disney never forgets the importance of a sweet treat!. This is a more budget-friendly option than the other Magic Kingdom character dining option, Cinderella’s Royal Table. The buffet lends itself to being a good option for picky eaters. The best seating of the day is the first seating when you can enter the Magic Kingdom and walk up Main Street before the park even opens. Get your pictures before entering Crystal Palace because, after you check-in, you won’t be able to leave until the park opens. When to Book: For 8am seatings, be sure to book 180 days before your trip. For other times, you’ll likely find seatings close to your date of travel, dependent on the time of year. During the high season, tables will fill up faster. Read more about dining at Crystal Palace. 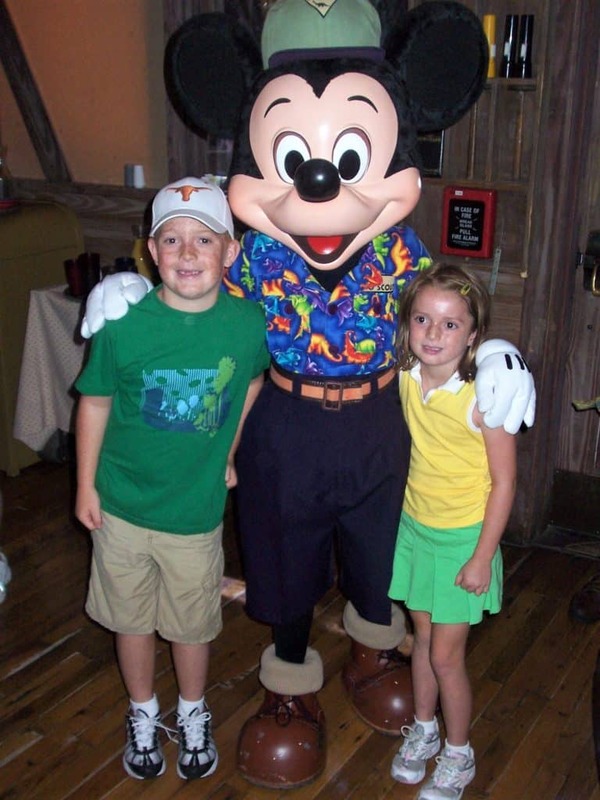 Is this your first trip to Disney World? Don’t miss our Disney World Tips for First Timers. Meals Served and Approximate Cost: Breakfast is about $50 per adult and $30 per child. Lunch and dinner are about $63 per adult and $37 per child. Those on the Disney Dining Plan will be pleased to know this meal is just one credit (versus two credits for Cinderella’s Royal Table). If your little princess has been dreaming of dining with the princesses, this is the place to be. Diners meet Belle, Aurora, Cinderella, Ariel, and Snow White. Before sitting down, take a picture with Belle. Since this restaurant is located in the Norway portion of World Showcase, the meal does have a bit of Norwegian flare. For breakfast enjoy a buffet of eggs, sausage, bacon, potatoes, assorted fruits, various pastries, a variety of cheeses, and Norway’s ever-so-popular herring. During lunch and dinner, there is a buffet of appetizers- seafood, cheeses, meats, salads, and fruits. Main dishes are served to you by a Norwegian server. Lunch and dinner options are Norwegian meatballs, pork tenderloin, herb roasted chicken breast, salmon fillet, potato dumplings, stuffed pasta, and a Viking Mixed Grill which includes tastings salmon, meatballs, and sausage with sides. Kids can choose from items such as salmon, meatballs, beef, pizza, and macaroni and cheese. Assorted desserts are brought out to share. The best seating of the day is before 11am when you can walk through the World Showcase before it opens. Be sure to have your little princess dress like a princess for this meal. 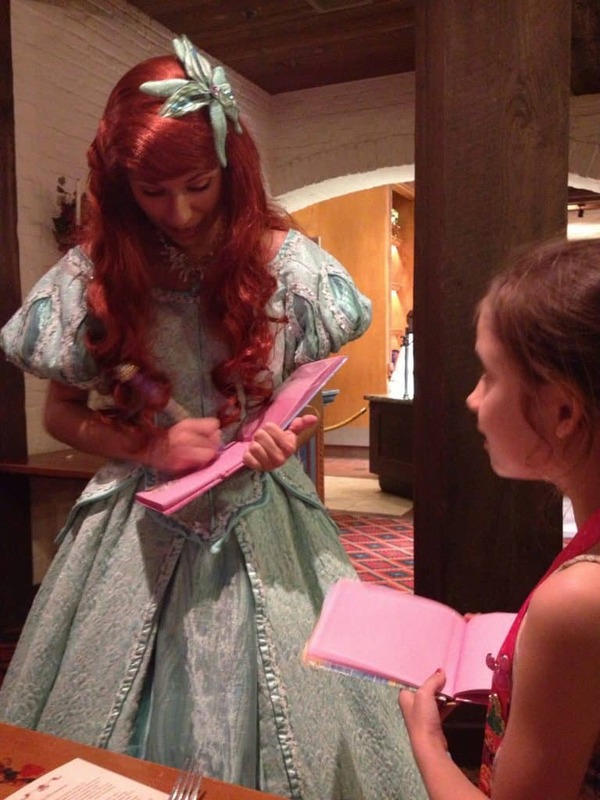 When to Book: As you can imagine, anything related to princesses books up fast. Make sure you reserve this meal 180 days before your travel date. Read reviews about dining at Akershus. Meals Served and Approximate Cost: Breakfast is about $34 per adult and $20 per child. Lunch and dinner are about $50 per adult and $30 per child. This meal requires 1 credit on the Disney Dining Plan. Enjoy a delicious family-style meal complete with vegetables grown right in Epcot! Have the autograph books open and ready for visits by Mickey Mouse, Pluto, and Chip ‘n’ Dale. No, your eyes aren’t deceiving you, the restaurant is actually rotating! Diners will complete a full 360 circle during the course of a meal. It does move at a snail’s pace, so no need to worry about motion sickness while eating. You will see scenes from the desert, rainforest, and farm as the restaurant rotates. Meals at this restaurant are served family style. The cuisine type is American. Breakfast includes eggs, Mickey-shaped waffles, sticky buns, bacon, sausage, fruit, and hash browns. Lunch and dinner feature a harvest salad, turkey breast, pot roast, pork with apple chutney, fries, mashed potatoes, stuffing, and veggies. The breakfast at Garden Grill is about as affordable as Disney World character dining inside a park gets. If cost-effectiveness is key, this meal is a great option. When to Book: At least two weeks to a month before you travel. Earlier during peak season. Read more about dining at Garden Grille. Meals Served and Approximate Cost: Breakfast is about $38 per adult and $23 per child. Lunch and dinner are about $53 per adult and $32 per child. This meal requires 1 credit on the Disney Dining Plan. The characters change depending on what show is popular, but at the moment you can meet Sofia, Jake, Roadster Goofy, and Doc McStuffins. Breakfast items at this buffet include Mickey-shaped waffles, pastries, fruit, and made-to-order omelets. Minnie and her friends dominate the dining scene at Hollywood and Vine after breakfast, but the theme changes from season to season. January through early March is a “Silver Screen Dine” and it takes place at dinner. The Springtime Dine and Summertime Dine dominate the high season (March through late August) and these take place at lunch and dinner. The Halloween Dine is from late August to early November. The Holiday Dine is a dazzling dinner party in November and December. The lunch and dinner buffet have American favorites like carved meats, soups, salads, shrimp, fish, mashed potatoes, and pasta, but keep an eye on the seating area to make sure to not miss a character while getting food. If you want to meet Disney Junior characters, the best seating of the day is 8am when you can enter Disney’s Hollywood Studios before it opens. If holidays are your thing, the Halloween Dine and Holiday Dine are great themed events to help you get in the spirit. When to Book: On the 180th day to get the 8am seating, but any other breakfast seating times can be grabbed close to the date of your stay. Special holiday lunch and dinners tend to fill up quicker, especially close to the date of the actual holiday. Read more about dining at Hollywood and Vine. Meals Served and Approximate Cost: Breakfast is about $38 per adult and $23 per child. Lunch and dinner are about $52 per adult and $31 per child. This meal requires 1 credit on the Disney Dining Plan. Located in the heart of Africa in the Animal Kingdom, this character meal offers a unique food buffet with many flavors native to Africa as well as classic American favorites. 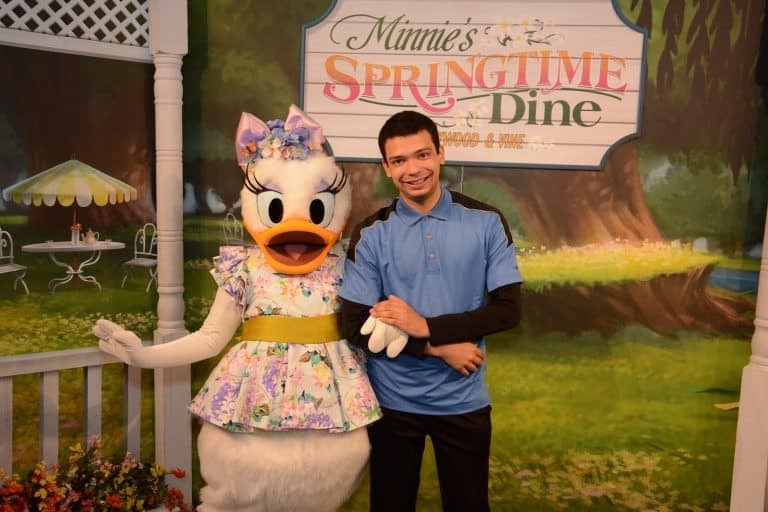 Meet with Donald outside for a family portrait and have your personal camera ready for table visits by Goofy, Daisy, and Mickey Mouse in their safari gear. Have the little ones sit on the seats at the end of the table for the best photo ops. For breakfast try beef bobotie (and African specialty) as well as typical eats like Mickey-shaped waffles, eggs, cereals, fruits, pastries, and a frittata. Lunch and dinner highlights include breads with dips, various salads, peri peri salmon, curries, chicken, as well as safe bets like corn dogs and macaroni and cheese. Many people feel that the best character dining food can be found at Tusker House. The best seating of the day is 8am when you can enter Animal Kingdom before it opens. As soon as you finish your meal, head over to the Kilimanjaro Safari to see the animals. You won’t even need a Fastpass+ since you are dining right at the entrance and should beat the crowds to the attraction. When to Book: Book on 180 days before you travel to snag the 8am seating times. You can book other times up until a month before you travel. Read more about dining at Donald’s Safari Meal. Meals Served and Approximate Cost: Breakfast and Brunch are about $25 per child and $45 per adult. Dinner is about $55 per adult and $30 per child. 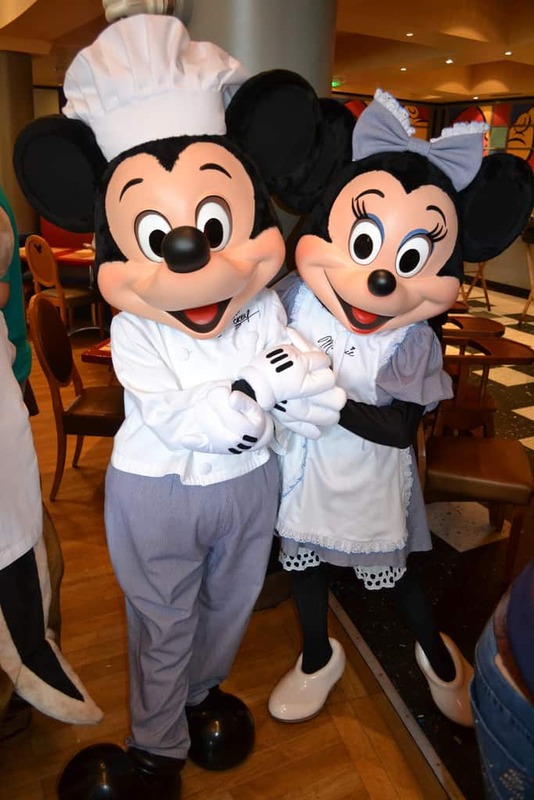 Chef Mickey’s is the meal to attend if you want to meet The Fab Five- Mickey Mouse, Minnie Mouse, Pluto, Donald, and Goofy– dressed in their chef gear. American food is served buffet style at all three meals. Breakfast and brunch might include Mickey-shaped waffles, eggs, bacon, scrambles, pancakes, and fresh fruit. Dinner highlights include ribs, roasted chicken, mashed potatoes, pizza, chicken nuggets, and mac and cheese. If you have “basic” eaters, they should be plenty happy here. There is plenty of energy, hustle, and bustle inside this restaurant. Expect things to be casual and fun. Since this resort is located a short monorail ride away from Magic Kingdom and Epcot, this character meal is can be easily enjoyed while spending the day exploring either park. The best seating of the day is 1.5 hours before the time the evening fireworks show is scheduled. There is a great viewing platform on the opposite side of the Contemporary Resort from the restaurant. Watch the fireworks and then hop on the monorail to return to the Magic Kingdom and catch a shuttle back to your Disney lodging. When to Book: This is one of the most popular character meals because it is close to the Magic Kingdom and is the only meal where you can meet the Fab Five. 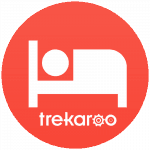 Book starting 180 days before your visit. Read reader reviews about dining at Chef Mickey’s. Meals Served and Approximate Cost: Breakfast is about $32 per adult and $20 per child. Dinner is about $45 per adult and $27 per child. This meal requires 1 credit on the Disney Dining Plan. The Supercalifragilistic Breakfast features the following characters: Mary Poppins, Alice in Wonderland, Mad Hatter, Tigger, and Winnie the Pooh. The mix of characters is fun and different, likely to make everyone in the group happy. The breakfast buffet includes strawberry soup, salmon lox, cheese blintz, eggs benedict, corned beef hash, a carving station, pancakes, waffles, biscuits and gravy, and fruit. For dinner join Cinderella, Prince Charming, Lady Tremaine, Drizella, and Anastasia for Cinderella’s Happily Ever After Dinner. This delicious dinner buffet includes food from several “kingdoms” around the world such as prime rib, Floridian strawberry soup, Mongolian stir fry, Mississippi catfish, and pork pot stickers. Cinderella and the Prince will dance and even invite the kids out to the floor. Be sure to get the video camera ready for Anastasia and Drizella’s visit to your table. There’s no way to know what those two will say! The best seating of the day is at 4:30. Arrive early and you might get to open the restaurant. This character dining option is less expensive than most and doesn’t require a theme park ticket, making it even more cost effective. If you are heading to the Magic Kingdom, the Grand Floridian is on the Monorail loop, making transportation easy and convenient. 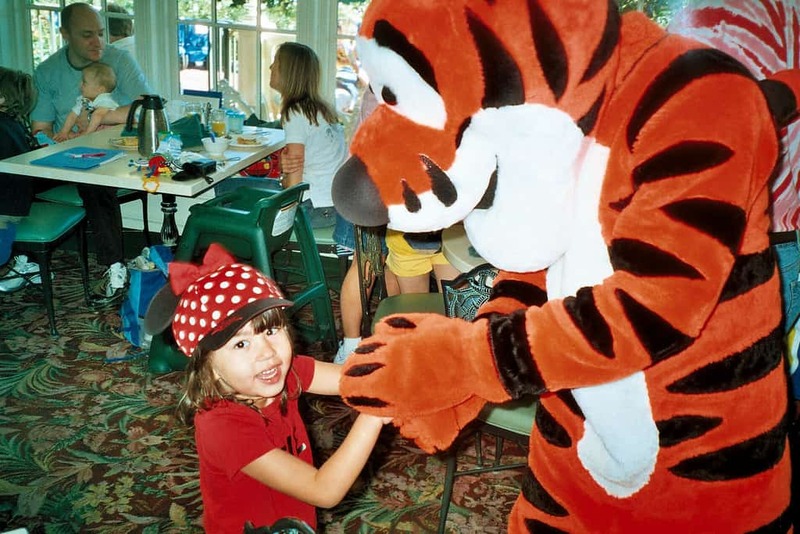 During lunch hours, 1900 Park Fare hosts a Wonderland Tea Party geared towards 4-12 year-olds. They will sip a special apple juice flavored tea, eat cupcakes, and make a craft. Characters from Alice and Wonderland will be at this Unbirthday Celebration. When to Book: Plan to book this one 180 days before your visit or as soon as you can. There are usually some seatings left about 2 months before you travel. Breakfast is much easier to secure than dinner. Read reviews about dining at the 1900 Park Fare. Check for deals on family-friendly hotels near Walt Disney World. Meals Served and Approximate Cost: Breakfast is about $34 for adults and $20 for children. Note: while the restaurant is open for a seafood buffet at dinner, character dining is only offered at breakfast. This meal requires 1 credit on the Disney Dining Plan. Book a breakfast reservation with Minnie, Goofy, and Donald dressed in their beach attire at Minnie’s Beach Bash Breakfast. Visit the buffet for delicious American favorites including the popular Mickey-shaped waffles, bacon, eggs, cereals, pastries, yogurt, and fruit. Book one of the last reservations of the morning and you might get extra character time while still enjoying food fresh from the kitchen. This is a good last minute option for families hoping to enjoy a character meal. When to Book: Anytime leading up to when you travel. Read more about dining at Cape May Cafe. Meals Served and Approximate Cost: Tea is served and the cost is $333 for one adult and one child. Each additional child is $234 and each additional adult is $98. The Disney Dining Plan is not accepted. This is much more than a tea party or character meal. Children are spoiled with various gifts during this very special experience. Little princesses will receive an Aurora doll, princess tiara, bracelet, necklace, princess scrapbook set, princess cinch bag, and a special rose. Little princes will receive a sword and shield as well as a plush bear. “Tea” (aka: apple juice for youngsters), tea sandwiches, fruit, and princess cake are served. 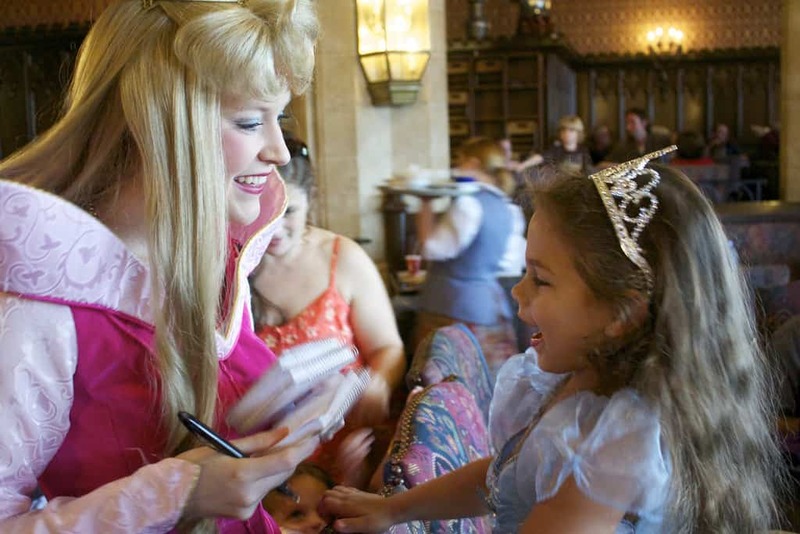 There is storytelling, sing-alongs, and a princess parade. Expect to meet Aurora at this event. 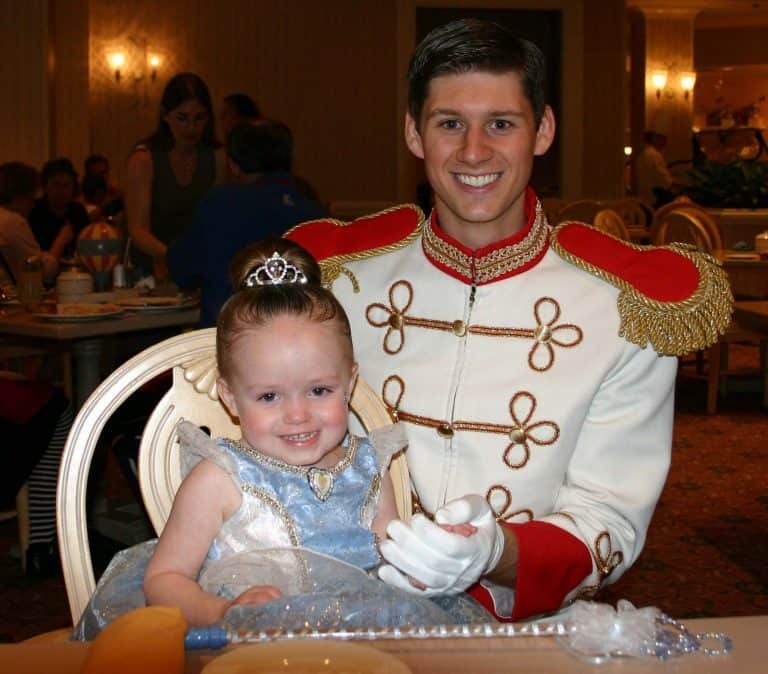 Kids are highly encouraged to dress up in the favorite prince or princess costumes. The gifts are included in the child price which applies to children 3-9. If you have an older child who you would like to lavish with gifts, the package can be purchased for an additional price. The tea takes place at 10:30 and is not offered every day of the week. It varies by season but typically takes place Friday-Monday as well as some Wednesdays. When to Book: You can book up to 180 days ahead of time. The weekend typically fills up quicker than the weekdays. Here are more tips for dining at Disney Parks. Meals Served and Approximate Cost: This breakfast is about $18 for children and $40 for adults. While breakfast is served at the restaurant every day, the character dining buffet is only open Thursdays and Saturdays, as well as Tuesdays during school breaks. Since this restaurant is in the Four Seasons, no Disney Dining Plan is accepted. Goofy, Mickey Mouse and Minnie Mouse are wearing their spiffy resort wear as they make the rounds at the character breakfast buffet. The quality of this breakfast buffet is definitely higher than most. There is a juice bar, omelet station, fresh fruit, cured meats, yogurt parfaits, bacon, and famous S’mores pancakes among various other items. Service is top notch and there is a less “rushed” feeling than some of the other character breakfasts might have. You can choose from indoor or outdoor seating. We suggest outdoor if the weather is nice because the views are lovely. Complimentary download of digital photos is included in the price. When to Book: You can book this experience fairly close to your travel dates. Of course, things book up quicker during busy holiday periods. Meals Served and Approximate Cost: Though the restaurant does serve dinner, character dining is only available at breakfast. Breakfast is approximately $36 for adults and $21 for kids. This meal requires 1 credit on the Disney Dining Plan. 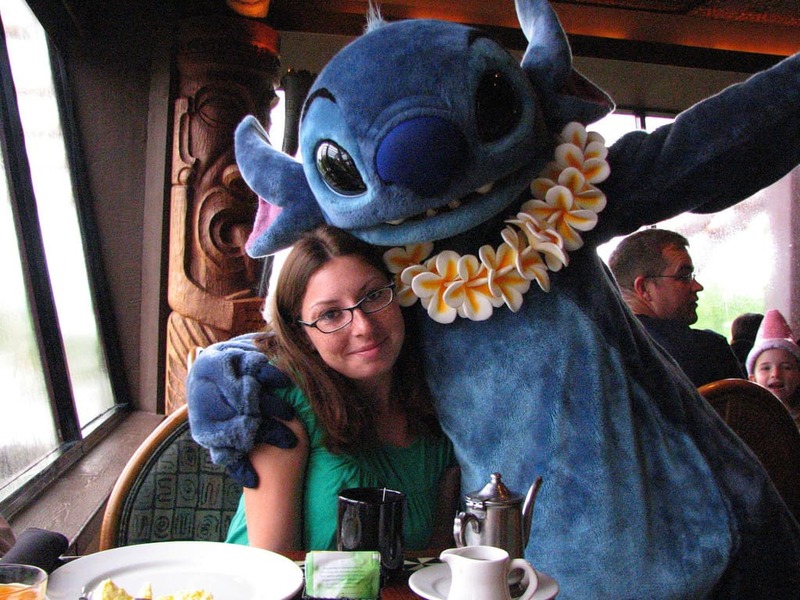 If you dream in palm trees and hula skirts, this is the character dining experience for you. Expect to meet Lilo and Stich, as well as some other Disney friends such as Pluto. This meal is a family style buffet which means big portions of food are served to your table (no buffet lines) and items are replenished as needed. Items served include Mickey-shaped waffles, eggs, potatoes, fruits, biscuits, ham, and Hawaiian pork sausages. Disney’s Polynesian Village Resort is on the monorail loop so this breakfast is a great option before spending the day at Magic Kingdom or Epcot. This meal is ideal if you want to spend less time waiting in buffet lines and more time at your table eating and visiting characters. When to Book: This meal tends to book up so try to book your meal at least a month in advance to get a good time. the earlier times go first so if you want those, try to book 180 days in advance. Meals Served and Approximate Cost: The only meal served is dinner. The approximate cost is $55 for adults and $33 for children. This meal requires 1 table service credit on the Disney Dining Plan. This is one of the newest Disney World character dining experiences (opened in December 2018). The rustic, forested ambiance of Disney’s Wilderness Lodge helps set the mood for a Snow White themed dining experience. 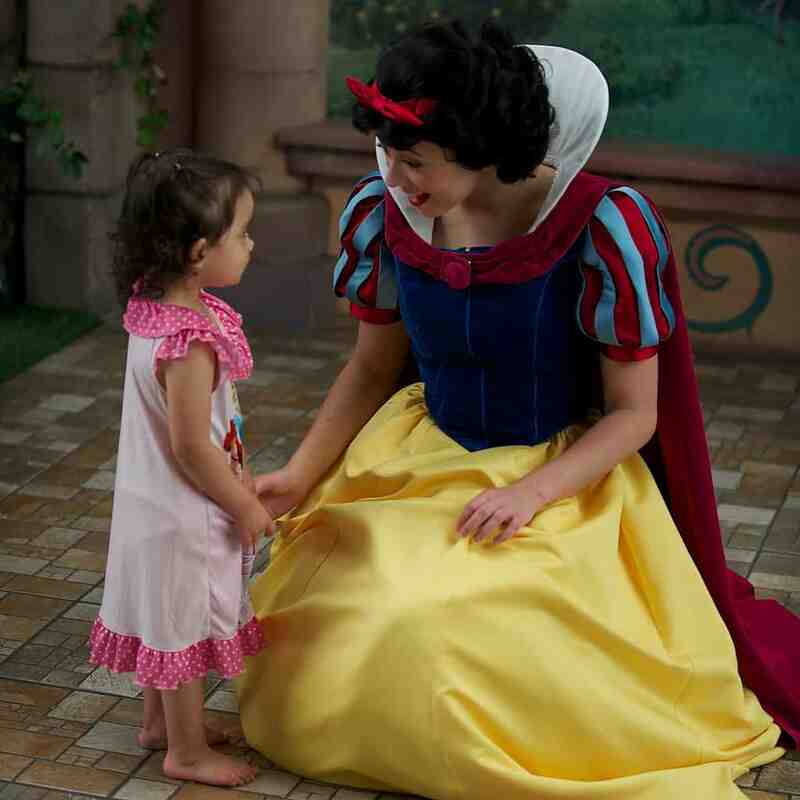 Expect to meet Snow White, Dopey, Grumpy, and even the evil Queen. This is a pre-fixe table service menu. It begins with shared appetizers such as winter squash bisque, Hunter’s pie, and shrimp cocktail. Entree choices include seafood stew, roasted chicken, prime rib, veal shank, and butter-poached snapper for adults. Prime rib roast, grilled chicken, pasta, and chicken tenders make appearances on the kids’ menu. Shared desserts include a sponge cake, gooseberry pie, crackled maple popcorn, and “poison” apple- a white chocolate apple mousse with a sour center. There aren’t very many places to consistently meet a Disney villain so if you are a fan, don’t miss this dining experience. 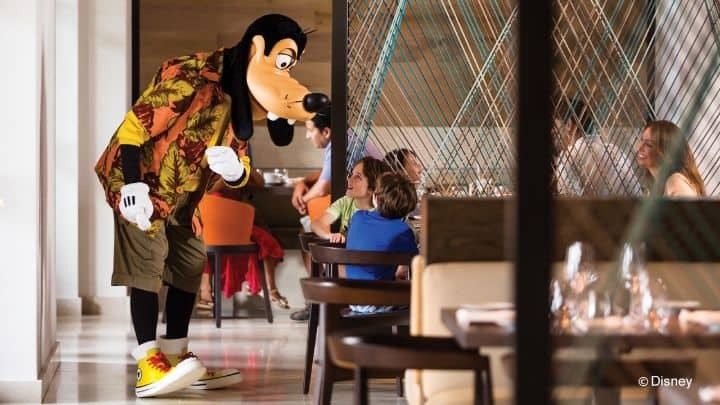 If you enjoy fun and creative cocktails and mocktails, this character meal offers several great options. Examples include the Smoking Mirror which is a whiskey cocktail that comes with a smoking glass and In the Clouds is a fun mocktail that features blueberry Monin poured over a fluff of cotton candy. When to Book: Since this is a new character dining experience, it will fill up quicker than some of the other hotel dining. Be safe and book as close to the beginning of the 180 day window as you can. Meals Served and Approximate Cost: While dinner is offered at this restaurant, the only character dining takes place at breakfast. The cost is approximately $38 for adults and $22 for children. This meal requires 1 credit from the Disney Dining Plan. Expect to meet Rapunzel, Flynn Rider, Ariel, and Prince Eric at this table service character meal. Breakfast includes a variety of pastries to share and fruit salad. Then diners can choose from a variety of breakfast entrees including a breakfast calzone, a frittata, steak and eggs, and a tower of pancakes. Children’s options include pancakes, Mickey-shaped waffles, steak, and scrambled eggs, and an egg white omelet with veggies. While most character meals featuring princesses tend to please the girls, this meal features some popular male characters which might appease your sons. There are Friendship Boats just outside the restaurant which will take you over to Epcot or Disney’s Hollywood Studios after your meal. When to Book: This is a pretty popular character meal so book early. Last minute reservations can sometimes be secured so it never hurts to check! Meals Served and Approximate Cost: A character meal is served daily and a character breakfast is available on Saturdays and Sundays. During the week an adult dinner will be between $30 and $40. Kids weekday dinner pricing is $8- $12. On the weekend the dinner is a seafood buffet and pricing is $40 for adults and $21 for kids. The character breakfast is $26 for adults and $17 for kids. Characters and cuisine vary daily, but Pluto, Chip and Dale, and Minnie Mouse have been known to stop by. Breakfast is served buffet-style and includes omelets, cereals, breakfast potatoes, pastries, and various “super foods”. The seafood buffet highlights include crab legs, seafood stew, seafood paella, NY Strip steak, a raw bar, and various breaded seafood options. Adult buffet can be upgraded to unlimited half lobster for $56. Kids who aren’t into seafood will be happy to find safe options like corn dogs, chicken nuggets, and mac and cheese. Kids who are into seafood can be upgraded to the unlimited lobster for $37. Making a last minute trip to Walt Disney World? This meal is a great last minute reservation as it rarely fills up completely. When to Book: Anytime. 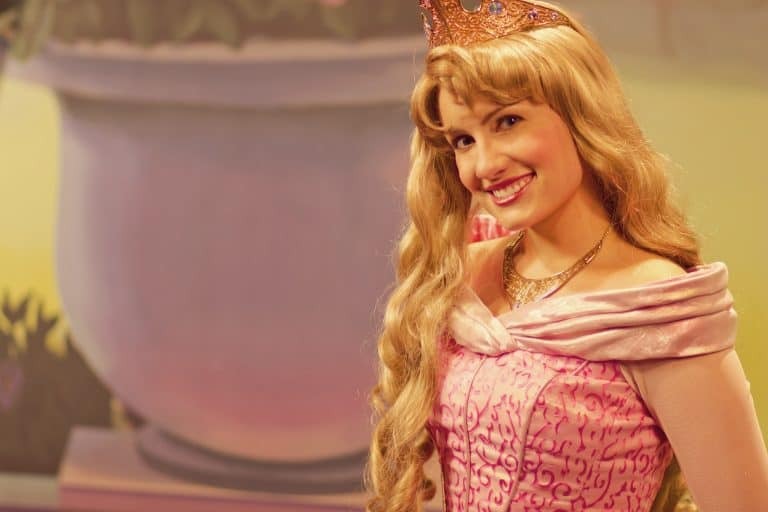 Of course, there is still a possibility that your preferred seating may be booked but this character meal doesn’t tend to feel up as much as many others. Read more about dining at Garden Grove. Want more details on Disney dining? 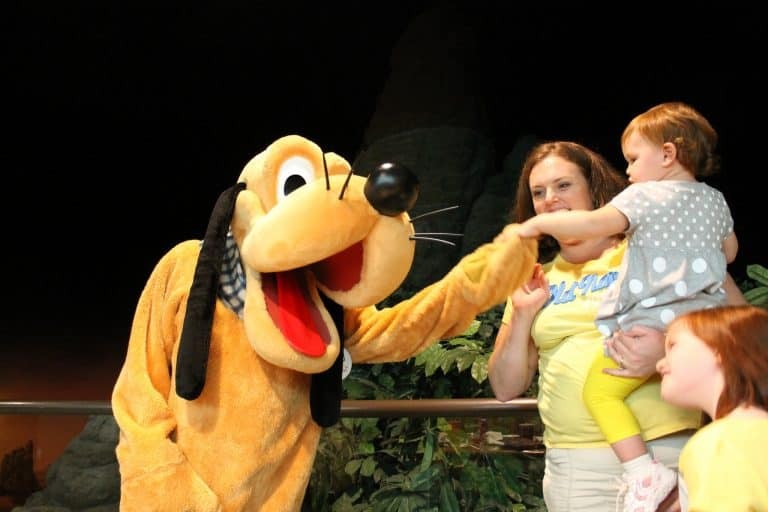 Check out Couponing to Disney! Thank you to Kristin Cooper who wrote the original version of this guide. It was updated in 2019 by Sharlene Earnshaw. 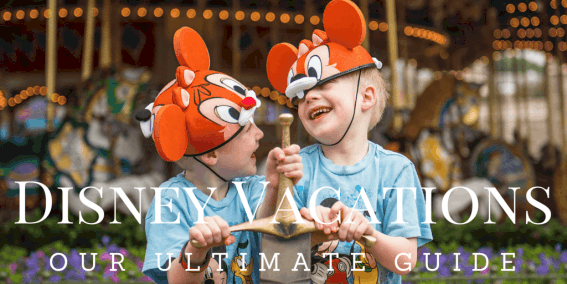 Our Ultimate Disney Guide is our go-to-resource for everything you need to know when planning the perfect family-friendly vacation. Explore our ultimate guides to the Disneyland California Resort, Walt Disney World, and other Disney properties, resorts, destination vacations, and cruises.